Zoe, is a great new addition in our family. Zach, my 13 year old now has a new lease on life also a rescue from you all years ago. They bonded instantly and I think at times he reluctantly puts up with her craziness but they do love each other. They are constantly playing and enjoying a slightly rambunctious lifestyle together and I could not be happier to see that. She has also slowly becoming a good running partner she loves the time outdoors both with Zach and our one on one time in our walks and runs. 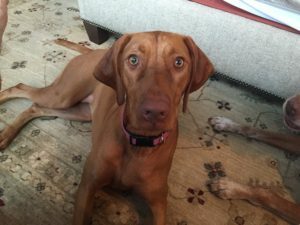 I thank Tampa Bay Vizsla Rescue for pairing me with such a great mate for Zach and we look forward to watching her grow with us for years to come.